Steve Smith has 64 receptions for 745 yards and 5 touchdowns in 2013. 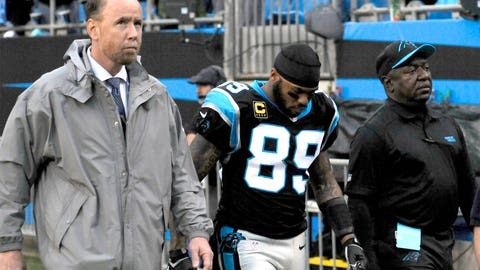 Steve Smith’s Monday morning MRI revealed the Panthers wide receiver sustained a sprained PCL in his left knee, head coach Ron Rivera announced. While Rivera said that it’s "highly doubtful" the 13th-year wide receiver suits up next Sunday, Smith was fortunate that it’s just a sprain and not a tear. The leading receiver in franchise history limped off the field against the Saints after a non-contact knee injury. He later attempted to return, but went straight to the locker room after one play. He was later ruled out for the remainder of the game. If the Panthers are able to win next week in Atlanta, it will buy Smith an extra week as the team would earn a first-round bye. During Smith’s absence, wide receivers Brandon LaFell, Ted Ginn and Domenik Hixon and tight end Greg Olsen will remain as Cam Newton’s targets.